Here’s an exciting little nugget: I was thrilled to contribute an article for this month’s issue of T+D magazine. The topic? “Tech Tools for Training”. As a longtime supporter of using cell phones and other devices in training sessions, this was a fun topic to explore. The article includes 8 easy-to-use apps and tools, as well as suggestions for surviving a technical malfunction or other disaster. I’m not going to quote the article in this post, but I did want to share it for you here on phase(two)learning! You can access the online version here. I’ve also added it to the Free Resources tab here on the blog. Enjoy! Your turn: What are your go-to tech tools to use in the training class? How do you leverage cell phones and other devices to engage learners? Share your favorites in the comments below! Know of someone who could benefit from this post? Be kind and share it! 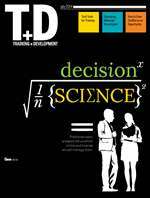 Bring phase(two)learning to your organization and take advantage of a July T+D special! Now scheduling workshop dates for Fall 2014 and beyond! Contact us before July 31 – mention the T+D article to receive 15% off your workshop pricing! Current topics can be found on the phase(two)learning official website, or just ask about a specific topic that is relevant for your team or event. #OneSimpleThing: A New Series From phase(two)learning! #OneSimpleThing – Who Ya Gonna Call?